After making the decision to pursue nursing as a career, your next major decision is considering nursing schools that will help you meet that career goal. An important part of the selection process is visiting nursing schools in person. It can be difficult to determine from a website or a brochure whether a school will be the best fit for you. Most schools will allow you to make an appointment to visit while classes are in session. This will help you get a feel for the school and what the campus is like. It also gives you the opportunity to speak to students and instructors and ask questions you might have about being a nursing student. When scheduling your visit, remember to make appointments to speak with school administrators to discuss the school’s curriculum, tuition and options for financial aid. 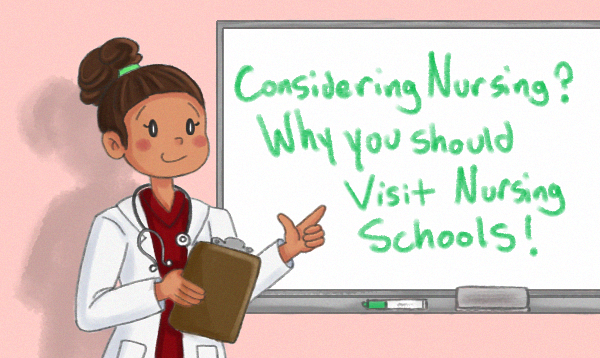 Don’t limit your options when considering nursing schools and their programs. Make sure to visit several schools so you can find the best program that fits your expectations and needs. While some nursing schools may be ranked high and be well known, they might not be exactly what you are looking for. Even with a bright job market, future nurses will face competition in getting the best jobs after graduation. And often the difference between a great job and a so-so job is the education and experience that is gained while in nursing school. So be choosey when selecting a nursing school because not all programs are equal when it comes to preparing you for a career in nursing.